Did you go to open house? I went to City Hall and Tweed Courthouse. These folks were at the Catacombs. A look inside the Green-Wood. #1: The path name was a surprise. All the others I saw had pastoral names such as Sassafras, Cyprus, Grove, and Magnolia. There's an Atlantic Ave.
#2, 3: Main gate near 5 ave and 25 st was built in 1861. If it looks familiar, the architect, Richard Upjohn, also designed Trinity Church. #4: On Dec 5, 1876, with over 1000 people in the audience, the Brooklyn Theater was destroyed by fire. Of the 295 people who died, 103 were either unclaimed or their families could not afford a burial. They were buried in a common grave on this site. 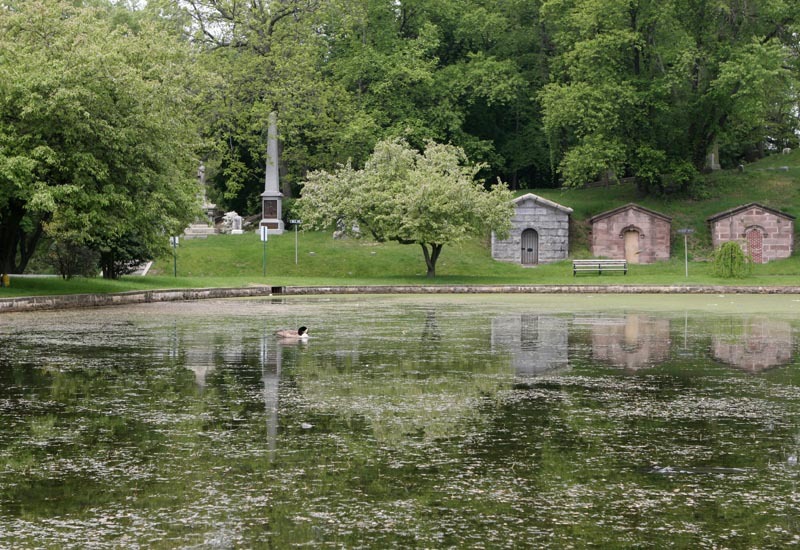 #5: When founded in 1838, Green-Wood, only the 3rd rural cemetery in the US, struggled financially. At that time, the preferred burial plot was in a small in-town cemetery. To gain publicity and acceptance, the cemetery arranged with the family of De Witt Clinton to have his remains moved from Albany to Green-Wood. Clinton, who was extremely popular in New York at the time, had died in 1828. The statue was on exhibit in City Hall Park in 1853 before being moved to the gravesite. #6: Albert Parsons (1847-1933), an Egyptologist, authored a book The New Light from the Pyramids. Note the mix of Christian and Egyptian images. Above the doorway is a representation of the Egyptian god Osiris, a guardian of temples. #7 – 13: Battle Hill. #7 is a monument to the New York men who fought in the Civil War. Erected in 1869. There was fighting on the hill during the Battle of Long Island. A ceremony is held every year on the anniversary of the battle. Many mistake this spot for the highest point in Brooklyn, but that is just across the road to the north. #14: No special marker indicates the significance of this hill, Brooklyn’s highest elevation at 220 ft. The graves on this hill date from the 20th century, since before then it was the site of a reservoir. #15: Henry Chadwick (1824-1908): Born in England, he emigrated to Brooklyn with his parents. In 1856 he witnessed a baseball game in New York and became a fan. He convinced the NY Times, for which he covered cricket matches, to cover baseball games, offering to report the games himself. He became America’s first baseball editor, was on the rules committee, developed the box score, and coined many of the now familiar terms: assist, base hit, double play, cut off man, chin music. President Teddy Roosevelt dubbed him the “Father of Baseball,” and he was elected to the Hall of Fame. His monument is adorned with a bronze mitt, catcher’s mask, and crossed bats. Charles Ebbets would visit the gravesite every year to lay a wreath. #16: Susan McKinney Steward (1848-1918): The first female African-American physician in NY and the 3rd in the US. #20: I’m surprised at the simplicity of the gravesite, but it sits on a hill with a good view and excellent drainage. 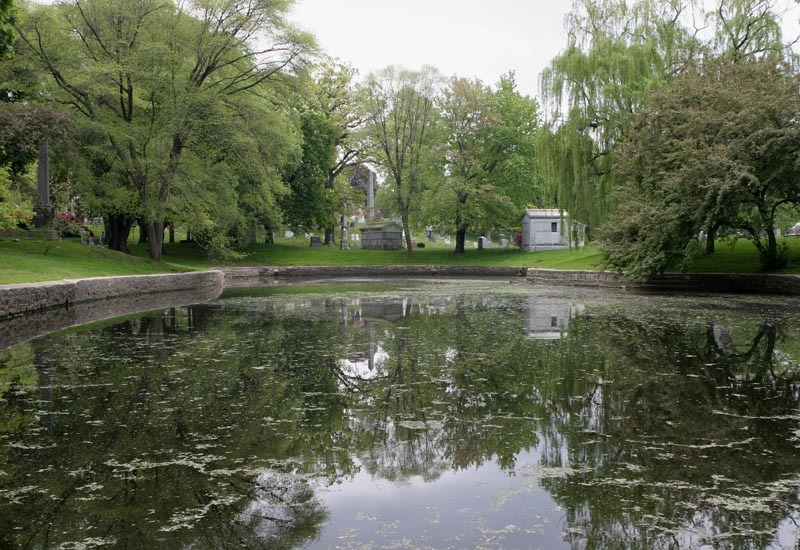 #24: There are 4 glacial ponds in the cemetery. #26: Chapel. In 1838, land was set aside for a chapel, but no plans were commissioned until 1900. One of the rejected designs, by Carrere &amp; Hastings, was modified and became the New York Public Library. The chosen design was by Warren &amp; Wetmore, who designed Grand Central Terminal. The Indiana limestone chapel is modeled after the Thomas Tower at Christ Church in Oxford. William Kingsley (1833-1885): The general contractor of the Brooklyn Bridge. His monument is a chunk of granite from the bridge. Thomas Durant (1820-1885): Union-Pacific RR. He drove the golden spike in 1869 that completed the Transcontinental RR. John Matthews (1808-1870): The Soda Fountain King. I’m sorry I missed this one, an elaborate and whimsical monument in marble and terra-cotta. Ironically, some of the detailing has been eroded by the chemical reaction of carbonic acid (acid rain), the same reaction which, in his soda fountain, made him a wealthy man. Bill The Butcher Poole is also here, but I wasn't about to look for him on Halloween. Maybe Edward knows where he is. It was a nice tour through a beautiful and interesting place. None of the residents complained. I've visited Highgate Cemetery in London, which is overpopulated and overgrown (giving it an intimate Romantic charm). Also designed by Richard Upjohn about 1850, it was built into the hillside so the constant cool temperature would help maintain stored bodies. During the 19th century, free interment was allowed here for 20 days while arrangments were made for a plot. The monument at the grave of Henry Chadwick, a journalist and tireless promoter of baseball who perfected the box score. Before A-Rod and Jeter, there were J-Creigh and Woodward. That would be James Creighton Jr., the world's first true baseball star, and John B. Woodward, an outfielder who became a Union general in the Civil War. Both played for the Excelsior Club - sort of the Yankees of the early 1860's - and now both reside in the Green-Wood Cemetery in Brooklyn. It is there, on Sunday, even as the Red Sox are gathering in Baltimore for the North American, Tokyo-free debut of the baseball season, that history buffs will assemble for the first organized tour of some extraordinary monuments and their century-old baseball adornments. They mark the resting place of some 200 important figures in the early decades of the game. All but a few of them - players, managers and sportswriters who are now credited with inventing and developing the sport - are forgotten. But intensive scholarship is showing that the cemetery is the final resting place not only for a Who's Who of baseball heroes and dignitaries of the 19th century but also for dozens of other trailblazers of the sport. "We knew that Green-Wood was a repository of New York's past, but we never realized the extent of the cemetery's inventory of early baseball history,'' said Richard J. Moylan, president of Green-Wood. 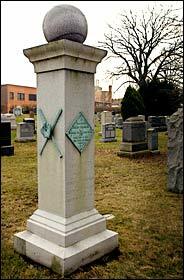 To Peter J. Nash, the monuments of Green-Wood are "a living history of 19th-century baseball in the land of the dead.'' Mr. Nash, an amateur scholar of the game who has spent four years poking around both hillocks and archives at the cemetery, has compiled these discoveries in a new book, "Baseball Legends of Brooklyn's Green-Wood Cemetery'' (Arcadia Publishing, $19.99). Jeff Richman, the cemetery's historian, has furthered this effort, using his encyclopedic knowledge of grave locations at the 478-acre property. "Peter came along and found baseball player after owner after team manager after scribe,'' Mr. Richman said. 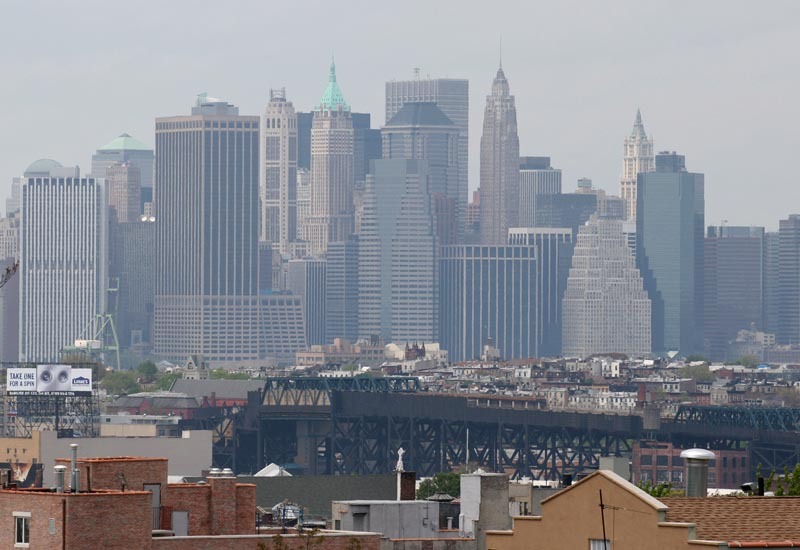 Their investigations have added weight to the growing body of evidence showing that the New York City region was an important incubator for the game. The monuments at Green-Wood, they found, chronicle the sociological transition of early baseball from a gentleman's game to a more capitalistic enterprise for professionals. And researchers were surprised to learn of so many connections between baseball and the Civil War. The development of early baseball paralleled the development of Green-Wood, which was incorporated in 1838. Among the nearly 600,000 people buried there are no less than four pioneers who were accorded the title "Father of Baseball" in the popular press: Henry Chadwick, Duncan Curry, William Tucker and William Wheaton. The memorial for Henry Chadwick bears a "Father of Base Ball'' inscription. A journalist and tireless promoter of the game who perfected the box score, Chadwick railed against corruption, was the editor of annual baseball guides and made the future existence of rotisserie baseball possible by pioneering the adoption of statistical measures like the batting average. The Chadwick memorial is topped by a massive granite baseball - complete with classic stitching - as well as a bronze catcher's mask and baseball glove. Its boundaries are four sculptured stone bases around the monument's perimeter, accurate down to the straps once used to fix them in place. Mr. Nash discovered some monuments, like that of Duncan Curry, by sheer chance, while walking through the cemetery. Curry, first president of the Knickerbocker Baseball Club, is immortalized with a monument that proudly dubs him "Father of Baseball'' because he headed the club that scholars say first codified many of the game's rules. According to a 19th-century account, Curry helped promulgate formal baseball rules with Alexander J. Cartwright and two other members of the Knickerbockers, Tucker and Wheaton (one of the game's first umpires). Cartwright is buried elsewhere. "Creighton was the first baseball immortal,'' Mr. Spencer said, "and given the myth about how he died - swinging at a home run ball - he is the perfect example of the sports figure becoming larger than life.'' Creighton is believed to have aggravated a cricket-game injury by playing a subsequent baseball game; he died four days later. Another Green-Wood resident, DeWolf Hopper, a thespian, delivered a rendition of the Ernest Thayer poem, "Casey at the Bat,'' shortly after it was published in 1888, and proceeded to perform it more than 10,000 times over the next half-century. One of his six marriages was to a Hollywood socialite who took his name: Hedda Hopper. At Tulip Hill, the imposing granite vault of the three Patchen brothers - Sam (shortstop), Joe (right field) and Edward (infielder) - is the only crypt of early baseball players, the Alou brothers of their time. Another pioneer at Green-Wood, Archibald Gourlie, a Knickerbocker, was fined six pence in 1845 for protesting an umpire's call, thus becoming the first player ever penalized on a ball field, Mr. Nash said. More recently, there is the imposing 1925 stone slab memorializing Charles Hercules Ebbets, the Dodger patriarch who gave his name to the imperishable home of The Bums. Tragically, Ebbets's partner, Edward McKeever, attended Ebbets's interment at the Green-Wood on a blustery day, caught a cold and died of pneumonia. Perhaps understandably, he is not buried there. Many players fought in the Civil War. Nelson Shaurman, for example, was the manager of the Brooklyn Charter Oak team. He gave up a captainship in the Brooklyn City Police Department to become a colonel in the 90th New York Regiment; during the Civil War he was brevetted to general. Creighton's teammate, Woodward, also traded in his Excelsior uniform for Union blue; ultimately the team sent close to 90 players to battle. The connection between baseball and the Civil War "is moving,'' Mr. Burns said. "The Civil War is, in a way, the representation of our unraveling and our undoing, and baseball - growing up at just that moment - becomes one of the agencies of connecting us, a kind of ritualized warfare in which nobody dies,'' he said. Mr. Nash has established a fund to erect monuments and headstones over the unmarked graves of baseball pioneers. Perhaps the most poignant example is that of James Whyte Davis, a president of the Knickerbockers, who was buried in his uniform, wrapped in the original team flag, without a gravestone. A happier story is that of Charles J. Smith, "one of the great players of the 1860's," Mr. Richman said. He was buried in a seemingly unmarked grave at Green-Wood. But investigation by a grounds crew discovered his monument last year, a few feet underground, where it had sunk. It has now been restored. Mr. Nash, 37, lives in Cooperstown, and is a businessman and the curator of a traveling collection of baseball memorabilia. He was once the rapper known as Prime Minister Pete Nice, co-founder of the group called, yes, 3rd Bass. Coinciding with the baseball opening on Sunday, Mr. Nash and Mr. Richman will give a two-hour tour of the monuments of Green-Wood's baseball legends (visitors are to gather at the main gate at 25th Street and Fifth Avenue in Brooklyn at 1 p.m.; admission is $10). The design of the Hillside Mausoleum addition brings Green-Wood’s “landscape” through the glass greenhouse enclosure, making the space an extension of the outdoors. The transparency of the envelope, the glass pyramids, and blocks of crypts at the top entry of the mausoleum integrate it with the surrounding monuments and landscape, cut into an extremely sharp sloping site. The Columbarium is conceived as a garden pavilion organized within a semi-circular wood and glass structure, enclosing a central meditation space set in a reflecting pool. Following the form of an existing hemicycle of urn burials and integrated with the circulation between the entrance gate and the chapel, the Columbarium expands the inventory of commemorative structures in Green-Wood’s extraordinary landscape. Interesting. The only other stacked mausoleum I'd heard of was the tower in Sao Paulo. The finishing touches are being put on a modern mausoleum in Green-Wood Cemetery in Brooklyn. An atrium and waterfalls are among its amenities. Coming soon: Brooklyn's newest, most astonishingly affordable real estate. Featuring: Historic parklike setting. South-facing panoramic views. Deluxe granite-sheathed elevator building. Five-story-high, twin interior waterfalls. Eleven-foot ceilings. Spacious interior lobbies clad in exotic wood. Custom-woven Tibetan rugs. Prices: Single occupancy from $16,200 to $27,800. Four-person occupancy from $31,150 to $48,750. No maintenance fee. The only catch? All occupants must be dead. Green-Wood Cemetery, the 164-year-old resting place of everyone from Boss Tweed to Leonard Bernstein and the original Brooks Brothers, is building a new mausoleum. 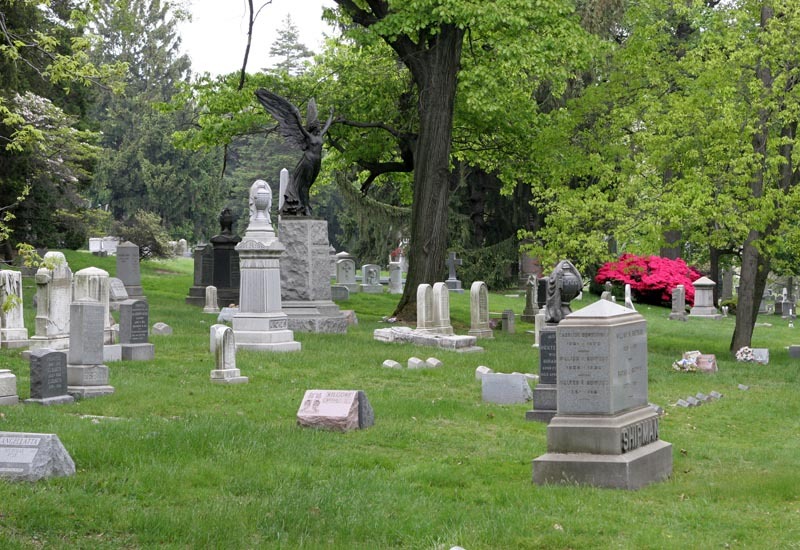 Not only will revenues from the $17 million building contribute to the cemetery's $10 million annual operating budget, but the, er, availabilities will also delay the day when Green-Wood must begin its transition to a historical park. "It enables us to extend the life of Green-Wood as a working cemetery," said Richard J. Moylan, Green-Wood's president, who said that the 478-acre cemetery will run out of space for in-ground burials in the next few years. The new structure for above-ground burials is called, in the undertaker trade, a community mausoleum, in contrast to Green-Wood's classic private family monuments. Workers are putting finishing touches on the interior of the new building, which is to be unveiled in September. Built into the side of Green-Wood's towering Ocean Hill, the five-story mausoleum has 8,000 square feet of floor area with room for 2,300 crypt spaces for coffins, and 3,800 niches for cremains. Not unlike new city condominiums, the mausoleum required a formal certificate of occupancy from New York City, even though the, well, status of its occupants requires its classification as a "storage facility." It will be Green-Wood's largest, most expensive and "best-conceived community mausoleum," Mr. Moylan said, referring to seven smaller structures built from the 1970's to the early 1990's. "We hope to make an architectural statement that this is as important as the other buildings in the cemetery." 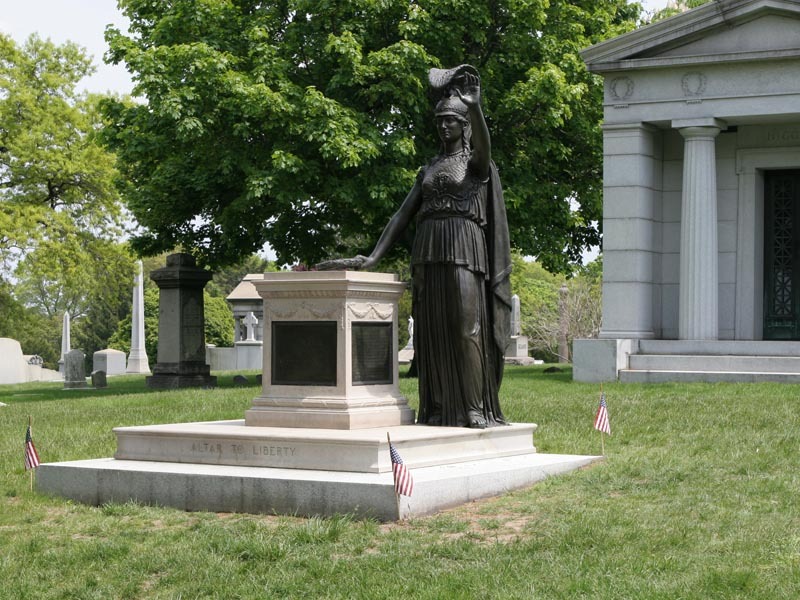 This is perhaps a tall order: for example, the architect of the nearby David Stewart mausoleum was Stanford White, and the sculptor Augustus Saint-Gaudens just happened to be available to create its statues. Paul Spencer Byard, who was the new mausoleum's designer with Ray H. Dovell, said it "speaks to the tradition of the pastoral landscape, the notion of Green-Wood as a soothing, comforting, evocative place where the notion of grieving and death is maybe something that is not so frightful." 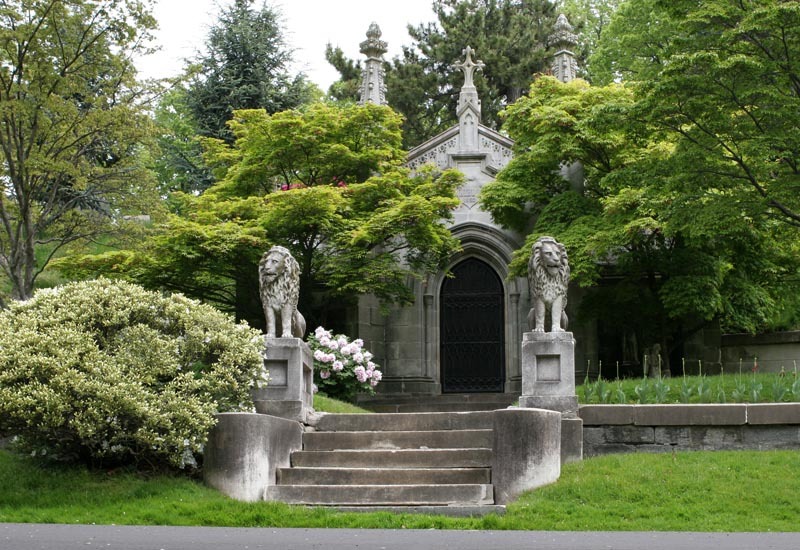 The mausoleum is a departure from the cemetery's Edward Gorey landscape. The building's most prominent feature is its greenhouse atrium, highlighted by a five-story shingled glass curtain wall at the front. "In its own cascade, it echoes the waterfalls," Mr. Byard said, adding that the tilted panes are intended to "catch the sky and its reflections; in the evening, it catches the light in a touchingly mournful way." "We chose a modern interpretation in metal and glass," Mr. Byard added, "because it would be inappropriate to fake-up some Victorian structure in 2004." There are step treads and handrails of honey-colored ipe (a Brazilian mahogany), and cremain niches covered in blondish anigre (a hardwood from Africa). There are custom-designed vigil lights (electric, of course) enclosed in fluted glass. The custom-milled bud vases are of nickel-silver-plated brass. "The interior is designed for the living, for their comfort and inspiration," said Mr. Dovell. And for their edification, there will be computerized information stations offering directions to crypt and niche locations, and even maps issuing forth from a printer. The mausoleum's ground-floor entrance connects with the cemetery's rolling greensward and its monuments to politicians, Civil War heroes, industrial magnates, disaster victims, gangsters and the nearly 600,000 others buried at Green-Wood since 1840. 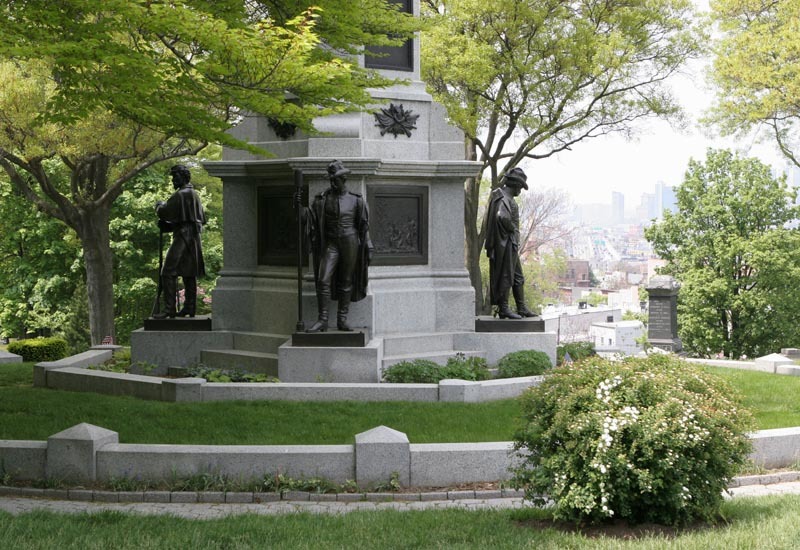 The third-floor level opens onto the cemetery's Dawn Path, leading to the mausoleum of the abolitionist Henry Ward Beecher and to the pyramidal monument of Henry Bergh, the founder of the American Society for the Prevention of Cruelty to Animals. On the fifth floor, a terrace gives way to Ocean Hill, the cemetery's second-highest promontory, which is actually the terminal moraine of the glacier that departed 18,000 years ago, leaving behind terrain that later became a Revolutionary War battlefield. Quite literally, then, "the landscape, and elements of the cemetery, go through the building," Mr. Byard explained. Atop the new mausoleum are two 16-foot-tall pyramids of glass. "The pyramid is one of the great funerary shapes from ancient times," Mr. Byard said. The mausoleum qualifies as a partly green building: its climate-control design is based on the insulating capacities of the earth, as half of it is built into the side of the steeply sloping hill. The waterfalls, of course, recirculate. No maintenance fees beyond the purchase price will be required since, by state law, 10 percent of the selling price must be placed into a permanent maintenance fund. Space at the mausoleum will be available later this month. The more expensive the crypts and niches are, the better they are situated - for the living. Those at the "eye and heart level," as Mr. Moylan called it, are the most sought after and will fetch a premium. While the prices of the crypts and niches are a fraction of the going rate for Brooklyn real estate for the nondeparted these days, the sticker prices are high enough to reflect the cost of the lavish construction. Nevertheless, the savings for potential customers are substantial from the $250,000 cost of a private mausoleum. That assumes, of course, that a place for such an extravagance could be found in the cemetery. "Mausoleum space," Mr. Moylan said, "is now virtually nonexistent." Altar to Liberty monument on the Battle Hill of the Greenwood cemetery. The Soldiers' Monument was erected in 1869 and honors the 148,000 New York men who fought for the Union during the Civil War. 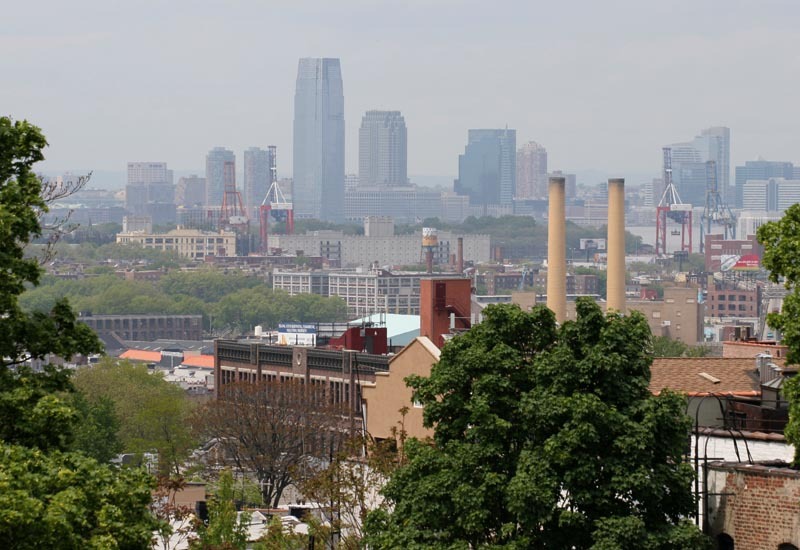 Panorama of Manhattan from the Greenwood Cemetery. Goldman Sachs Tower, 160 Imlay Street, and the future site of the Red Hook Passenger Ship Terminal. 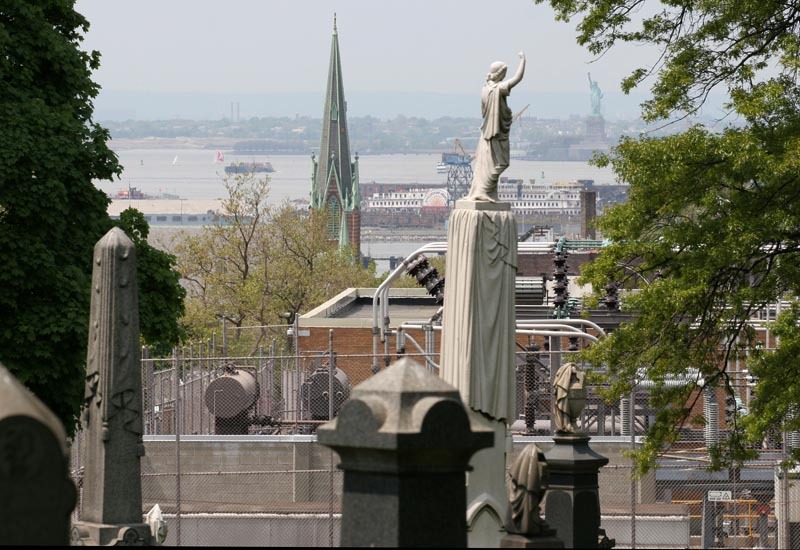 Monuments of the Greenwood Cemetery, Red Hook, and the Statue of Liberty. More pictures from around the Greenwood Cemetery. That would be an interesting place to have to do some network troubleshooting.